2 Where Are Bluegill Found? For many youngers the bluegill is their introduction into fishing. They are seemingly easy to catch. The larger fish put up a fairly decent fight, they taste absolutely delicious, and they can be found just about anywhere there is water. Bluegill are not picky eaters. This makes catching them on just about any bait or lures possible. It is still possible today to find fishermen on the bank of a creek with nothing more than a cane pole, some line, a hook, and a bucket of nightcrawlers fishing for bluegill. In this article, I am going to cover what bluegill are, where to find them, how to catch them, and more! 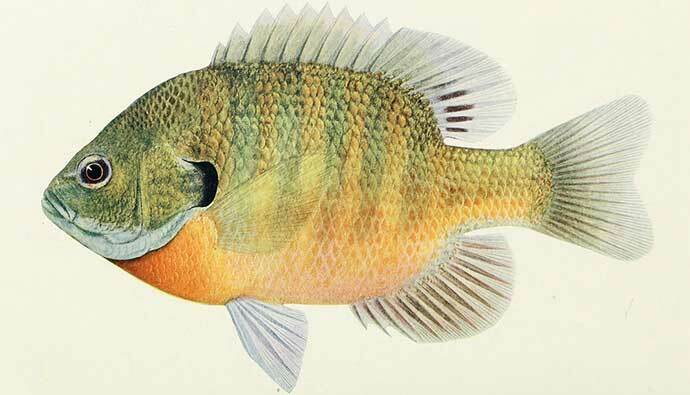 Bluegill (Lepomis Macrochirus) is a widespread species of freshwater fish. They are sometimes called bream, copper nose, or brim. The Lepomis Macrochirus is a member of the widespread family of sunfish Centrarchidae in the order Perciformes. They are native North American and live in rivers, streams, ponds, and lakes. They are commonly found east of the Rocky Mountains. They usually hide in and around old tree stumps and many other underwater structures. They can live in very deep as well as very shallow water, and will very often move back and forth depending on the season or time of day. They also tend to drift to water plants and the shade of trees along the banks where small insects fall into the water regularly. Here’s a good size bluegill. 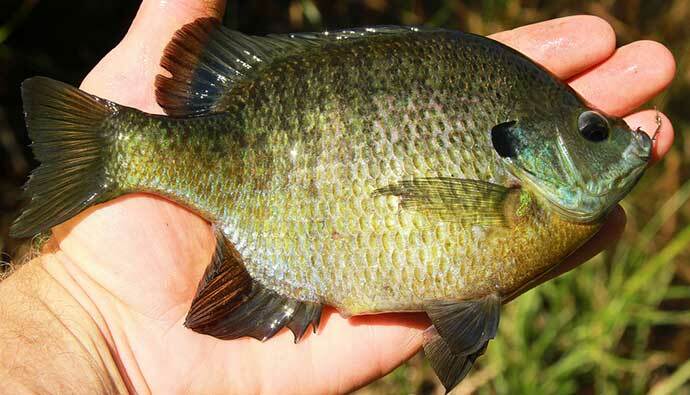 Bluegill can grow to 12 inches long and can weight up to 4.5 pounds. They have a very distinct coloring, with very deep blue and purple on the face and gill cover. As well as dark olive bands down the side, and a burnt orange/yellow belly. These fish will eat just about anything they can fit in their mouth as they are naturally omnivores. But mostly feed on small aquatic fish and insects. These fish play a vital role in the food chain for walleye, muskies, trout, herons, bass, snapping turtles, kingfishers, and otters. Bluegill naturally occurs in the United States on the east side of the Rocky Mountains, from Florida to coastal Virginia. Then west to Texas and northern Mexico, then north to western New York and western Minnesota. But today they have been introduced almost everywhere in the North Americas. They have also been introduced to South Africa, Europe, Zimbabwe, South America, Asia, and Oceania. They can also be found in the Chesapeake Bay which means they can stand up to a 1% salt content in the water. In some of the locations they have been introduced to they are considered pests, trade in the species is against the law in Japan and Germany. In the case of Japan, these fish were given to the prince in 1960 as a gift by the mayor of Chicago at the time. The prince then gave them to the fishery research agencies in Japan in which they escaped and became an invasive species. They have wreaked havoc with the native species. 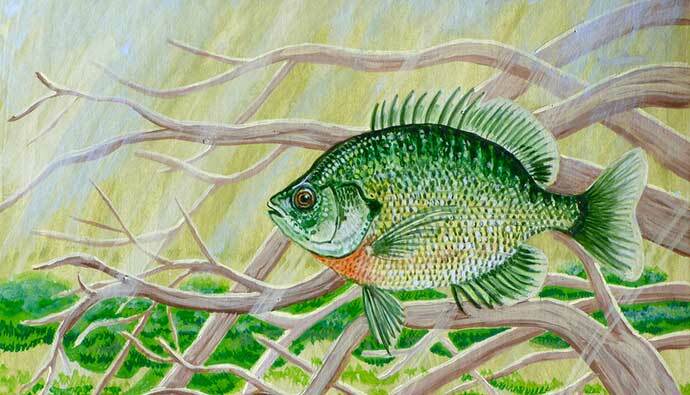 Bluegill lives in shallow water in many lakes and ponds as well as slow-moving areas of streams and small rivers. They generally stick to water with an abundance of aquatic plants and like to hide between water weeds and fallen logs. They are more often than not found around weed beds where they spawn or search for food. 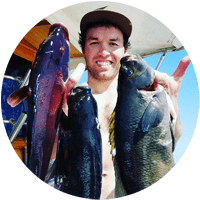 In the summer adults move to deep open water where they like to suspend just below the surface to feed on the plankton and other small aquatic creatures. These fish are often found in schools of 10-20 fish and these schools will often include other panfish. Think small when fishing for bluegill, the best live baits for bluegill are crickets, grasshoppers, or worms. A number 6 hook should be large enough for your bait but should also be small enough for the gill to swallow the hook. Ultralight tackle is a must too as well as 2-6 lb test line. Bluegill will be staying at various depths, in the summertime. The fish will be deeper in bigger lakes but they stay shallow in ponds where the higher oxygen content is. The key to catching monster bluegill is to use the heaviest split shot sinker you have. 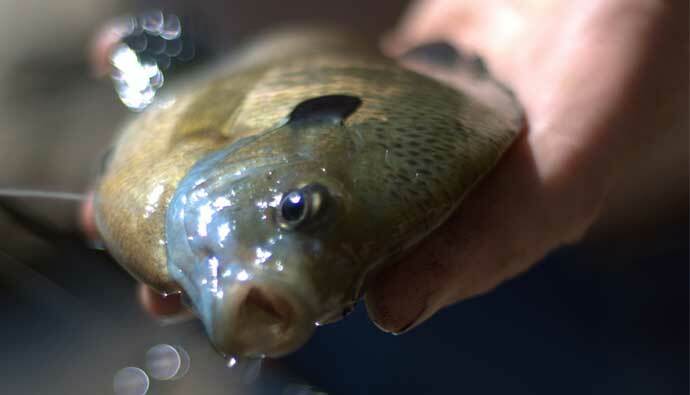 This is to allow your bait to fall quickly past the smaller gills into the bull bluegill’s mouth. 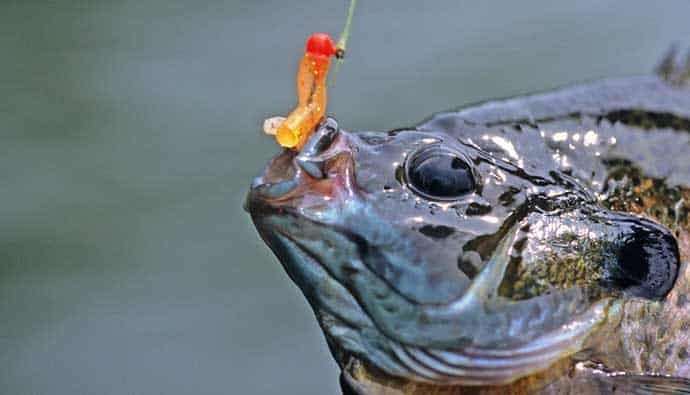 Bluegill is easier to catch on bait but will bite lures as well. Small 1 inch minnows, little spoons, marabou jigs, pretty much anything meant for crappie with a small enough hook and presentation will work wonders for bluegill. If you happen to run out of living bait. Bluegill is a popular fish for ice fisherman in the wintertime. Mealworms and waxworms are on the top of the bait list when catching bluegill under ice. You can also use small jigs, tiny spoons, and artificial flies for when you run out of bait and there is still plenty of fish around! The best time of day to fish for bluegill is in the morning and evening with the evening having the higher feeding rate. 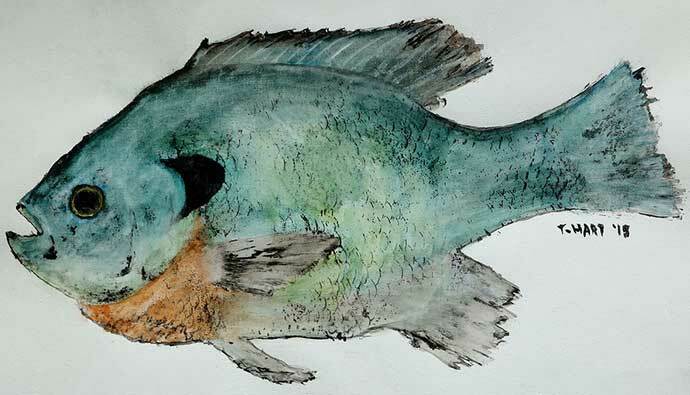 Now that you’ve caught some bluegill, it’s important to know what to do with the ones you want to keep. Here’s a recipe from the Taste of Home that’s sure to make you and your friends’ mouths water. In a shallow bowl, combine the first five ingredients. In another bowl, whisk eggs. Dip fillets in eggs, then coat with crumb mixture. Dip again in eggs and crumb mixture. In a large skillet over medium-high heat, cook fillets in batches in 2 tablespoons oil for 2-3 minutes on each side or until fish flakes easily with a fork. Adding oil as needed. Melt butter and stir in the last six ingredients. Pour enough of the butter mix into the bottom of a large glass baking dish and swirl around to coat the fish. Place the fish fillets in a single layer in the dish, then pour the remaining butter mixture over top. Broil, 4 to 6 inches beneath the heat source, for 10 minutes, or until the fish flakes easily with a fork. It does not matter if you are a seasoned fisherman or a beginner looking for where to start, bluegill is just plain fun to catch and even more fun to eat! So why don’t you go out grab your son, daughter, niece, nephew, granddaughter, or grandson and go teach them how to enjoy the great outdoors and let them learn to love to fish! If I missed any tips you recommend or another recipe you think we’d enjoy, please let it in the comments below!